"May I raise a question after a discussion we had in Luxembourg recently, about icewein. Must be picked at minus 7 degrees and pressed while still frozen. But, I was once told that there is also something else happening to the wine stock at minus 7. 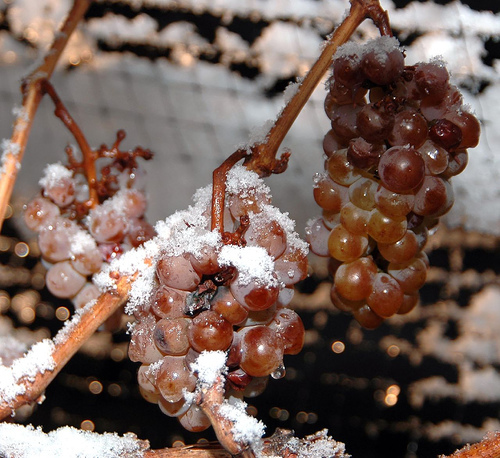 That some “elements” are withdrawn from the grape during this freezing process, which also contributes to the divine taste of eiswein. Therefore, real eiswein should/must be made this way ?? Have you heard about this process and which elements are withdrawn ?? Best regards from an eiswein lover in Norway." Well, Dag. Allow me to first refer you to a fun article I wrote a few years ago called, "Ripeness or Ruin." It is my understanding that the divine taste of Eiswein is derived from the fact that the extract is devoid of most, if not all, water (since it's frozen). Thus the extract is fruit-essence goodness (sugars, -ols, etc. ), which apparently ferments slower than typical must. 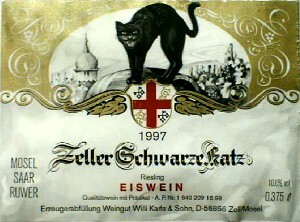 Perhaps the combo of less/no water and slower fermentation adds to the otherworldly flavor of Eiswein. Any Eis-experts out there care to chime in? Now that you know a little about the epic history of Sherry, It's time to learn what all the fuss was about. Buckle up. I'll do my best to explain how Sherry is produced and which grape varieties are used to produce the various styles of this Spanish treat. Part 2: "Waiter! There's a 100 Year Old Wine in My Sherry." What would you say if I told you that a glass of 100+ year old wine will cost only a few bucks at a tapas bar? This is the beauty of Sherry. Sherry is a blended, non-vintage wine - and in some cases, a portion of the wine used in the blend is decades old. Sherry producers go to great lengths to produce a consistent 'house style.' In this respect, Sherry is similar to Champagne. Of course, in most other respects, Sherry is utterly unique. Jerez, the demarcated Sherry production zone, is situated in the southernmost region of Spain. The region's otherwise toasty climate is moderated by the Atlantic Ocean. Still, only a few miles inland, summer temperatures can reach 100F, while coastal communities enjoy much cooler air (~20F cooler). In addition to hot hot heat in the summer time, Jerez experiences essentially drought conditions from June through October. Grapes growing in this environment need to be tough. The luckiest vines grow smack-dab in the middle of the Sherry Triangle (the 3-town triangle, which forms the nucleus of Jerez). In this sweet spot, spongy, water-retaining Albariza soils slake the thirst of hot grapes during the hostile growing season. Albariza is a chalky, calcareous soil. In fact, vineyard sites within Jerez are ranked by the amount and depth of calcareous minerals within the soil. 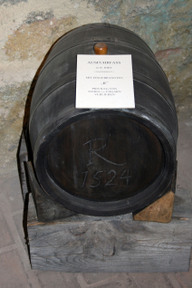 The town of Rust, near Lake Neusiedl is famous for its nobly rotten dessert wines called Ruster Ausbruch. In the best sweet wine vintages, Ruster (pron. 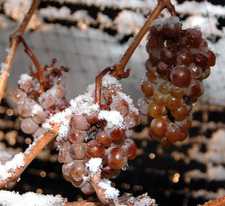 roos-ter) winemakers are able to select from extraordinarily high amounts of botrytis-affected raisinated grapes. This is due to the high air humidity, often produced by the lake in the autumn. Botrytris cinera, in its noble, benevolet form, pierces a grape's skin and drains much of the water from the flesh. The result is a shriveled grape, which contains highly concentrated sugar. For connoisseurs of these luxuriously intense wines, Austria is right at the top of the list, in terms of quality and value. In addition to sweet wines, many winemakers in Rust are also producing interesting dry wines on the gentle slopes further away from the lake where botrytis is less common. This week I was able to visit three of talented Ruster winemakers. See the photo gallery here. Kurt Feiler took some time out of his hectic wedding preparation schedule to give me a tour of the vineyards in the Rust area. He pointed out that much of the sweet wine is made from lower lying vineyards that are close to the lake. These vineyards are in the fog belt, which is where botrytis likes to play. We also toured the 'higher altitude' vineyards that are only a few hundred meters above the lake. However, this slight height advantage enables him to produce some incredibly intense red wines. 2003 Solitare - This wine is a cuvee of Blaufränkisch, Cabernet Sauvignon, Merlot and Zweigelt. 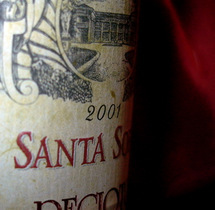 It possesses a veritable scaffolding of spice, chewy tannins and slick, lasting finish. The wine attacks with spice, tannins and cocoa notes. It then slowly gives way to black cherry and black currant flavors; while evolving a thick smooth mouthfeel during the finish. 2004 Umriss Blaufränkisch - The quintessential expression of Burgenland's flagship grape. Umriss comes from a rocky vineyard containing chalky soil. It spends 12 months in small barriques before bottling. The wood treatment seems to restrain the spicy-fruity character of the BFrank - allowing it to reveal itself slowly in the glass. Umriss is silky smooth in the mouth with an interesting minty twist on the finish. 2002 Traminer Beerenauslese - While not as intense as the Ausbruch wines, I found this wine to be quite compelling. It offers lychee Gewurztraminer scents along with honeysuckle and apricot. In the mouth, I wasn't immediately reminded of syrup, which enabled me to taste complexities and textures often missing in sweet wine. Feiler Artinger wines are available through Winemonger. Imagine you’re visiting Vienna and decide to take a weekend road trip. You drive out of the city and motor towards the southeast. As this is your first out-of-Vienna excursion, you fully expect to encounter a hilly, if not mountainous, landscape. However, to your surprise, the land flattens, and the horizon begins to stretch out towards infinity. Then, inexplicably, it appears as if you’ve arrived upon the shores of a great sea. 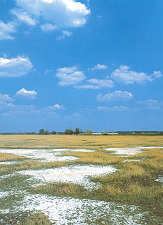 Welcome to the Neusiedlersee (Lake Neusiedl). Were this the 5th century, you might be wary of exploring the eastern shore of Neusiedler See. Thunder against a clear sky would mean only one thing - Atilla and his horse-mounted huns are on the prowl. Run for cover! Fortunately, it’s the 21st century and the only danger in strolling around the lake’s right coast is a flying stork with good aim and a vendetta. From my conversation with Francois Pouliot - proprietor of La Face Cachée de la Pomme. 1. Why apples? Because Hemmingford, Quebec isn't exactly the easiest place in the world to grow grapes. 2. The Cidery's first vintage was 1994. 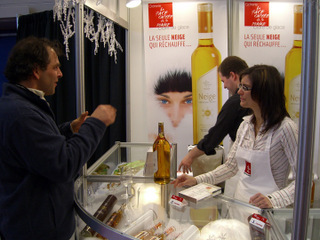 However, until 2001, apple ice wine was mostly a hobby for Francois and his wife Stephanie. Currently, La Face has 16 employees. 3. The term, Neige means snow in French. The cidery's special cuvee is called Neige Eternelle. 4. For Neige ciders, apples are harvested late in the autumn, stored until late December and then pressed. The juice is stored outside where water separates from the sugars as it freezes. Once the temperature dips to -25 (C; not F) the concentrated nectar is brought inside and gradually allowed to ferment. 5. La Face Cachée de la Pomme uses 8 different apple varieties in its cider, with Macintosh being the dominant variety. WineBloggingWednesday #16 "Judge a Bottle by its Cover"
Carols greet me as I shed my coat and brush snow from my hat. The door jingles shut with the familiar seasonal sound of sleigh bells. Tis the season for wine lab-els fa la la la. I begin roaming the aisles searching for a label that grabs my attention. Doon whimsy, watercolor flowers, goats-a-roaming, regal ducks, gothic script. Nothing causes me to break stride. I've seen it all before. Round two: a tango-ing couple, elks and stags, birds of prey and carved heads. Still nothing. During my third orbit, it registers: Santa. That bottle says Santa. I step back, observe that I'm in the small & odd-sized company that is dessert wine. I look again and verify that I was indeed reading correctly: "Santa." It was as if I had been guided by a shining star (or 80 watt bulb). I found Santa's wine! I picked it up, rotated the label slightly and read: "Santa..... Sofia." Sigh. But still, this was the label that stopped me in my tracks (plus, upon further inspection, it does depict a cunning lion and two unclothed sirens. So there's that). Considering the time of year, a label with 'Santa' written in red is indeed apropos. Maggie of The Offensive takes it a step further and tastes several ice wines (a few posers and a few real deals). Check out the comments as the conversation turns to apple wine, which sounds very interesting, with the caveman from the great white north chiming in.